The Hamilton Beach Knife is the best electric knife on the market. Carve meat and slice bread with ease using the Hamilton Beach Electric Knife. With this carving electric knife, you can easily carve a whole Thanksgiving Turkey or slice the softest cheese and ham for sandwiches. The electric knife features two stainless steel reciprocating blades that create slices of uniform thickness. 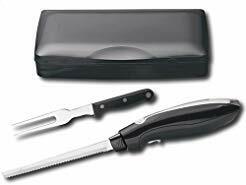 This Hamilton Beach chrome electric knife has a comfortable easy-to-grip handle and comes with a carving fork and compact storage case.